There is a local guy that loves the Tie Punisher. He doesn't usually do tournaments, but he played last month with a bunch of guys doing tournament prep with their tournament lists. He beat 4 out of 5 of them, including Blake, who is listed in that ranked X-wing players thing. Blake came in 23rd at Worlds. These guys aren't bad players, but they lost to a list that had at least one Tie Punisher in it. I don't think they are horrible, but I know people don't usually play them. I also think the next wave will have 3 things for them. One is Unguided Rockets (yes, that can also be used by Bombers). Another is the Bomb System thing in the H-6. The third is the other Bomb thing in the H-6. There already was Light Weight Frames that also helps it. It will also help when the next Nerfing happens and the power spike of the last OP ones are taken down a notch. Did he use a generic or one of the named pilots (and can you remember what build)? My thinking usually is that the generics don't do anything the Bomber can't do better, while the named ones get way too expensive very fast (though I did run 33 points of Redline for a bit and it wasn't awefully awefull). I'd very interested in hearing how someone who plays Punishers a lot looks at them. The thing is no one ever ignores it, the opportunity to drop it before it can get off all it's expensive munitions is far to attractive. Any advantage that it might have had over the Bomber due to the extra slots or boost is negated by the lack of EPTs on all pilots, which makes it really hard to get dice mods if you actually use the boost particularly with having to choose between LWF and GC, this on top of the terrible durability to cost issue. AS EI Deathrain can be fun but you pay out the *** for it and it's really unlikely to make those points back before it gets dropped. The big issue though is that anything it can do the Bomber can do for much less points. Someone proposed giving it access to reenforce which would help a good bit with the durability issue but it'd still need something to boost it's offense to make up for the lack of EPTs. I 100% agree bomber is the better choice hands down. I only really play in a casual environment so I tend to find my punishers get ignored as much as they're focused down so I do get the opportunity for them to survive through a game. 2x punisher 2xbomber was probably some of the most fun games I've played with them. Though I do like to throw the named pilots in to random lists 2 x strikers and redline worked well enough. I'm pretty sure it was Deathrain, but I can get the list if you want. He's pretty good with flying them. Not surprising Deathrain is by far the most viable pilot, as far as that goes. Considering what FFG did to the Kiharzx title, naming it the Vaksai, I would entertain the idea that the Punisher is going to receive a TIE/Interdictor title card, what it would do however, i don't know. 1. Reduce the cost of all equipped munitions by 1. 2. Ignore the "discard" part of torps and missiles for both the TL and the upgrade. 3. Allow you to equip as many modifications as you want as long as the total equipped cost does not exceed 2. All of that makes it cheaper and hit more efficiently. 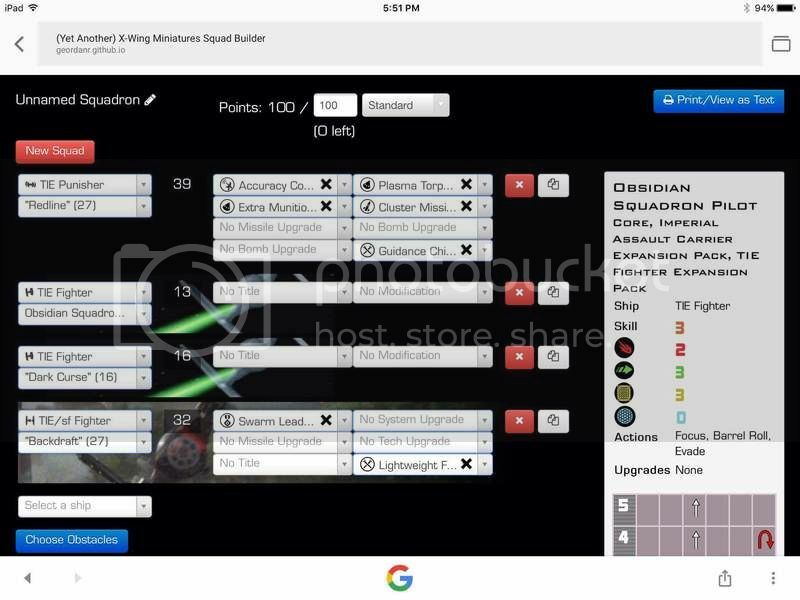 3. allows you to equip Guidance Chips, Long Range Scanners AND autothrusters if you would so choose. 2. At the start of the combat phase, if you are not stressed, you may acquire a target lock on one enemy ship that is at range 2 - 3 and within your firing arc. This one makes it overall cheaper (extra munitions for 1 point!) and solves its Target Lock problem. 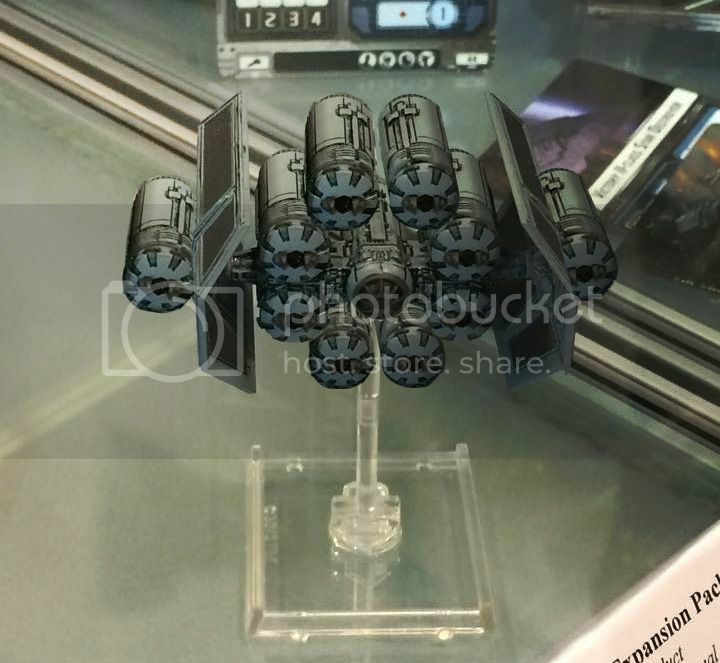 This gives it a massive advantage over the TIE Bomber and makes it a very specialized ordnance carrier, which allows the TIE Bomber to then focus more on bombing. It also frees up it's System Slot, allowing you to use it for other things. Adding the stress, arc and range limitation gives it some counter play. Personally hope to see it be able to specialise in either Missile/Torps OR Bombs (ie 2 title style of approach, like Defenders or Scyks - but not necessarily titles if a title aims to fix durability, whilst other slots provide specialisation). As much as (I think) it's pretty awful to look at, to see it in a similar state as Miranda, where you can feel justified sinking half your points into it. I just sent my request for his list. Was busy, but should get it. He often does both named guys. Redline can be pretty viscous, too. Plasma Torps w/ free TL is nice. 3 pts for Homing Missile w/ extra shield damage. The second one seems far more likely, though it doesn't help Deathrain and bomb builds quite as much they are slightly better off right now anyway. The down side to these is that they don't do anything for helping the ship stay alive so they might not be enough. How dare you! She is beautiful and voluptuous! Yeah, to make it competetive I'd scrap that along with the Cluster Missiles. It probably is the ultimate failsafe for those and for giving you a solid offense after the warheads are gone. My thinking is that Redline is so likely to be gone at that point as well that I'd not put the points in. My build that I plan to run for the next few weeks is just Proton Torps and EM with Guidance Chips and Collision Detector. Maybe I'll downgrade the Protons to Plasmas given the popularity of shields. What about a new system upgrade that does something along the lines of reinforced deflectors? When defending against an attack from a secondary weapon, you may ignore the first uncancelled hit result. That would work on B-Wings too. Maybe even an E wing. Well....this list beat 4 out of 5 of the other lists, including Blake's. Blake is ranked in the top 50 players. He made 23rd at Worlds. Maybe we just have to see it. You know, the Accuracy Corrector works on the Cluster Missiles, too. Redline only gets one re-roll and then one GC. There is always the ability to ensure he gets at least 2 hits on each volley. Probably pumps one up max (if he needs it) and then can use AC if it needs it for the second. Also, if not firing Missiles, he gets 2 hits each time. That's max damage for him. I wouldn't say it's a horrible list. It certainly isn't, but for me stripping Redline down a bit to be able to run both Backdraft and Quickdraw is a big deal. Personally I think it's time to give up on the failed Punisher experiment, consign it to the ugly TIE bin and bring out the expansion that should have taken it's slot in the first place. No that thing is an ugly discrace on the Imperial legacy and will thankfully most likely never happen. It's made the Imperial Navy a laughing stock! And if that wasn't bad enough, it can't even efficiently fulfill it's intended role! It's a great looking ship and the most logical design for a TIE super heavy ordinance carrier. Memes tell you literally nothing about anything. I've said this before but the Gunboat is never going to happen, I thought people would have figured that out by now. Outside like a dozen people on this forum very few people care about it at all and many don't even know what it is. Moreover they are never going to make a small base Imperial ship that isn't a TIE because even the most obscure TIE has a design aesthetic that anyone just walking in off the street can look at and go "Oh that's an Empire ship from Star Wars." The TIE look is is one of the most iconic things about the Empire and FFG knows this, did you read the Aggressor spotlight last week? "Flying in the skies of occupied worlds, these TIEs served as reminders of the Empire's power and ambition. They helped establish its cruel order. They represented the Empire and its tyrannical regime. And they are the ubiquitous reminders of the Empire's far-reaching military might in X-Wing™. From the Classic Core Set and Wave I through the releases of the TIE interceptor, TIE bomber, TIE phantom, TIE defender, TIE advanced prototype, and TIE Striker, the TIE fighter and its many variants have fought to preserve the Empire's interests throughout the galaxy and around the globe. Now, the upcoming release of the TIE Aggressor Expansion Pack looks to add new muscle and utility to this line of TIE variants, even as it hews closely to the aesthetics and mechanics that allow it to serve as an unmistakable symbol of Imperial power." Its a love letter to the TIE line and underlines basically every point I've made about the Gunboat for years because not only does every single TIE look leagues better then it FFG would be unimaginably foolish to give up that kind of brand recognition. Particularly for something as ugly and obscure as the Gunboat which hasn't had a meaningful media appearence in over a decade for very good reason. Anyway. Back to our beautiful, buxsom bombardier. After you execute a boost you may assign a Reenforce token to your ship. At the start of the combat phase you may aquire a target lock on a ship inside your fireing arc at range 1-3. These are my title ideas for the Punisher fix. TIE/IT glues FCS on the system slot, and makes the ship something truly to be feared. It will turn the punisher into something the bomber could never be, justifying the point cost increase. The TIE heavy bomber (although cosmetically different, we have seen stuff like that with the Vaksai and Royal guard titles) is a card that makes the Punisher into a super bomb carrier, at the cost of torps and missiles. I like the concepts here but the first one will be extremely OP, potentially letting you shoot once in the activation phase then twice in the shooting phase. The second one is very interesting but you run in to the eternal issue of having way more ordnance then you could ever spend before you die even if it is less costly. I like the concepts here but the first one will be extremely OP, potentially letting you shoot once in the activation phase then twice in the shooting phase. Perhaps if it said "After you perform a Target Lock action..."
Then, the only risk is external effects that enable you to perform an action outside the 'Start of combat phase' timing. That in turn could be remedied by "You may only perform actions during the Activation Phase." (this gives a counter-balance to the powerful double-tap potential of this, especially when the target could be tokenless for the first shot). With this alteration, I really like this suggestion. That's still a bit much, it would let a PS2 Punisher nuke any ace in the game with munitions in the activation phase before they get an actions.